NewFirst off....I want to say a HUGE apology to AP for not posting this last week. I had a bit of a issue with the auto post feature. Apparently you have to set it to auto post on the correct day. Shocker, I know! 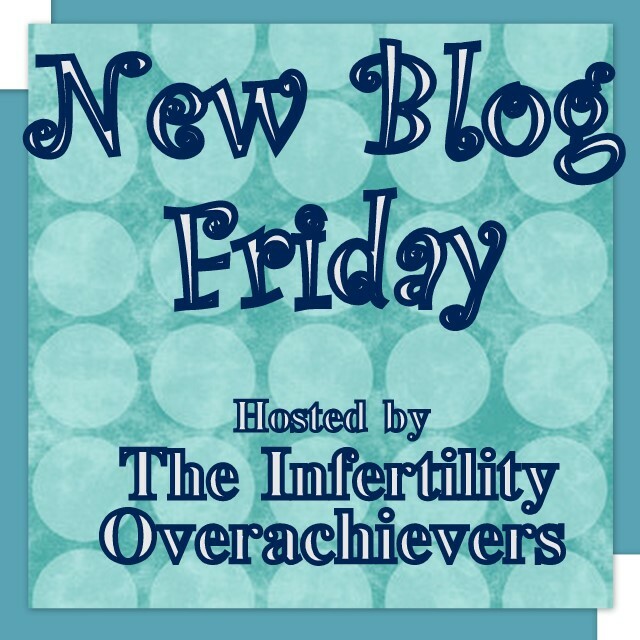 This week on New Blog Friday is AP from over at My Dusty Uterus. Hi Everyone! 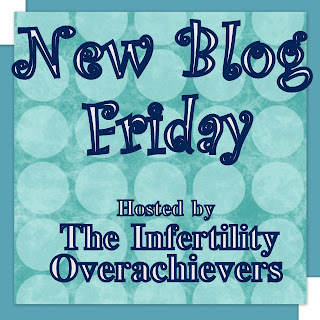 I’m thrilled to be Aly’s featured New Blog Friday! Thank you, Aly for helping the newbies out. You are my personal Carlisle, guiding me through the newborn blogging phase. You rock! My blog name is AP. I keep my true identity hidden lest someone random from my real life, like Creepy Produce Guy or Saturday Morning Spin Instructor stumble upon this and blow my cover. AP is short for “Annie Pie” which is my husband’s sickeningly sweet nickname for me. Not wanting readers to gag upon reading my name, I made the executive decision to go with AP. This is me with big sunglasses, still masking my identity. My husband and I dated for four years before getting married in 2006. We were married in the Finger Lakes Region of Upstate New York on a gorgeous September day. With a Golden Retriever added to the mix, we settled into married life. Kids were the last thing on my mind. During my teenage years I decided I could live without them and never looked back. On my 30th birthday I snuck a glance in the rearview mirror and reconsidered. Just before my 31st birthday I told my husband my position had changed. After a little convincing that my “zero-child” clause was non-binding, he was all in. A basket of nerves forsaking my old self, I threw away my pills in June. YIKES! And of course, I was late. Then later, and finally late enough to share my fear with my husband: I was pregnant. With the stick shaking in my hand, I took the test and calculated my due date as sometime in April. Furies be damned! It was negative! I grabbed another Michelob Ultra and assumed my body just needed time to get over 10 years on the pill. 129 days later, when a progesterone-induced period finally arrived, I knew the ugly truth: my ovaries are in lockdown mode. No egg can escape. “PCOS?” you ask. Nope, even better. My doctor told me I exercise too much. I laughed out loud when she told me that, but she didn’t think it was funny. I’ve indulged her theory and slowed down. I used to be a crazy marathon runner but since a back injury left me on the sidelines, I’ve been biding my time at the gym. Maybe too much time. I started blogging to keep my sanity and find humor in my padlocked ovaries. I don’t know about you, but over-exercise tops my list of comical diagnoses. To get a sense of how I write and what I’m all about, I recommend my first post, my favorite post, and the post that reserves my spot in hell. My blog is organic and austere (read: bland). I am open to tips and suggestions on jazzing it up. Heck, if I could get a picture in the header, I’d pop open the champagne! Today is a big day for me, not only because of New Blog Friday, but also because I’m going to make my virginal foray to Twitter. I have no idea what kind of attack birds are waiting for me, or what I’m even doing out there, but it’s time to give it a go! Thanks for reading! I look forward to getting to know everyone. Go show AP some love by commenting or even becoming a follower!! Great choice and congrats AP! I managed to make my own blog header in that stupid "paint" program found in every accessories file on a computer. It's 1000x 200 pixels and my question is: how do I put it in as my blog header and what code do I use? I've googled this problem for hours and I'm about to curse the computer demons that are causing this dilemma. Any help would be extremely appreciated!